It is probably the best known maritime tragedy in history. The RMS Titanic, the largest passnger ship afloat and pride of the White Star Line, was three days out of Southampton on its maiden voyage to New York City when it collided with an iceberg and sank. Of the 2223 passengers and crew, fully 1517 of them were drowned, largely due to an insufficiency of lifeboats. It’s a matter of historical record that the eight members of the ship’s band continued to play as the ship sank, in a feat of gallantry intended to keep spirits high. All eight of these men died in the sinking. Debate has raged over what their final song was. Some claimed that is was ‘Autumn’, others that it was ‘Nearer My God To Thee’. The debate is further complicated by the fact that ‘Autumn’ could have referred to either hymn tune known as “Autumn” or the tune of the then-popular waltz “Songe d’Automne” (although neither of these tunes were included in the White Star Line songbook). Similarly, there are two arrangements of ‘Nearer My God To Thee’, one popular in Britain and the other in America (and the British one sounds not unlike ‘Autumn’) – and a third arrangement was found in the personal effects of band leader’s fiance. 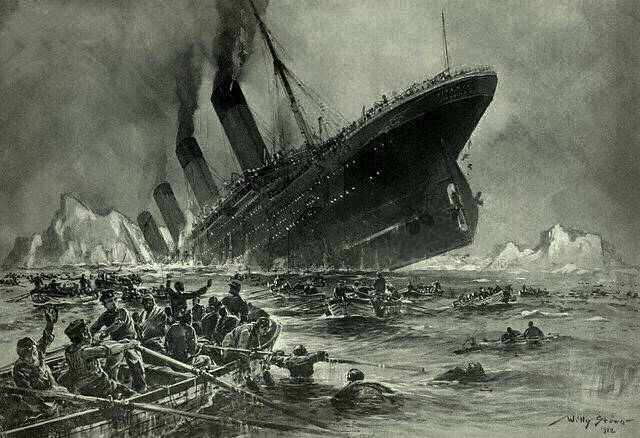 Tagged 1912, Apr 15, Dance Band on the Titanic, Harry Chapin, Metal Church, Nearer My God To Thee, Rest In Pieces (15 April 1912), RMS Titanic.